partman_server crashes on Ubuntu 12.10 server for amd64 when trying to partition an Advanced Format (4k / 4k sector) hard disk. Disks that utilize 4k sectors with 512 emulation work fine. The installer has no problems with those. 1) Begin the installation in EFI mode. 2) At the disk partitioning stage, select "Guided use Entire Disk" or "Manual"
3) Review and accept the proposed partitioning scheme and write changes to disk. Installation should carry on without a crash. I'm unlikely to be able to debug this without a traceback. Does the same crash by any chance happen in a desktop installation? If so then it might be possible to get a core dump; if we're extra-lucky apport might be able to process it, but even without that the core dump or /var/crash/ file would probably be useful. Thanks, Colin. I'll try out a desktop installation and see if I'm able to get anything more useful for you. Attaching the crash file from /var/crash/ . The desktop installation failed in the same way (i.e. installer appeared to get 'stuck' when trying to create filesystems on 4k/4k disks). Ah. The problem is that libparted doesn't have 4K sector support for FAT; and isn't going to get it because most filesystem creation code has been removed upstream. We need to use something like mkfs.msdos instead. This is also going to require creating a udeb from dosfstools, so that mkfs.msdos is available. instead of deprecated and semi-broken libparted code (LP: #1065281). Accepted dosfstools into precise-proposed. The package will build now and be available at http://launchpad.net/ubuntu/+source/dosfstools/3.0.12-1ubuntu1.1 in a few hours, and then in the -proposed repository. Accepted dosfstools into quantal-proposed. The package will build now and be available at http://launchpad.net/ubuntu/+source/dosfstools/3.0.13-1ubuntu0.1 in a few hours, and then in the -proposed repository. I'll try and grab another coredump. Do we need the actual udeb in the build for this to work? Turns out the image is getting respun later today to add the missing udeb. I'll try again this afternoon. one is no longer present. I just tested the re-spun image 20130118.1 and verified that the dosfsutils udeb is getting loaded. Unfortunately, the installer still failed in the same spot with the identical segfault message. Attaching dmesg, partman, and syslog logs. Made some on-the-fly changes to 50format_basicfilesystems per Colin's request. * Depend on dosfstools-udeb for the changes in 25ubuntu3. Much better progress with the image from today (2012.01.21). The installer will no longer crash / hang when trying to partition an Advanced Format disk in EFI mode. The installation itself completed all the way to the end. The problem now is that, upon reboot, we can't boot the operating system. 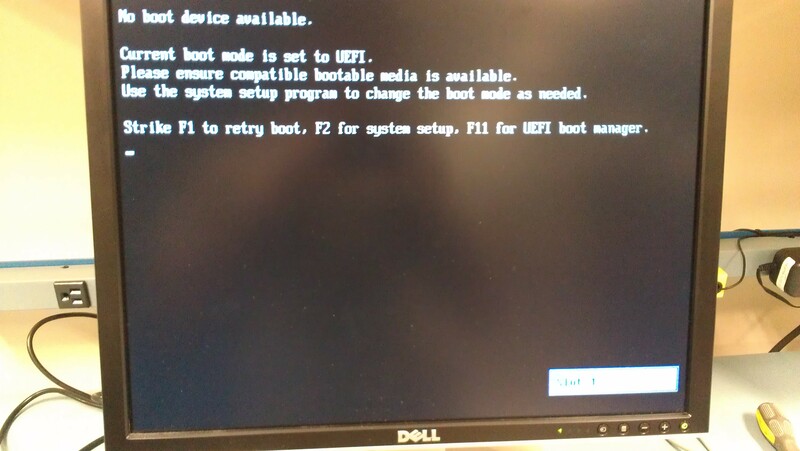 There's no option in the EFI boot menu to boot Ubuntu. I thought that maybe we'd be able to add the entry in by hand (at least) to get the OS booted, however, there are no files on the disk to point the boot menu to. Attaching dmesg, syslog, and partman. These were captured at the end of the installation, but right before rebooting for the first time. Could I have a raw dump of the first megabyte of the disk, extracted using dd, as well as a raw dump of the first megabyte of /dev/sdb1? It looks as though perhaps libparted and efibootmgr are disagreeing over what makes a valid GPT, and I'm going to need to walk through it by hand. Ah, I've tracked this down to efibootmgr not supporting 4K-logical-sector disks. Fortunately, Fedora has a patch for this, which I'll backport. support non-512-byte logical sectors (LP: #1065281). Colin: I've subscribed Matt to this bug and will email him requesting that he incorporate that in a new upstream release. Jordan Hargrave now owns efibootmgr. I've asked him about incorporating this patch. Kent: Could you please retry with the raring server image I built this afternoon (20130123.1)? I believe it should be better now. The patches have already been in upstream efibootmgr for 2 years. I could cut a new release though. Tested the 20130123.1 build. I got a little bit farther with this one, but, still couldn't boot the OS. Yesterday, there wasn't even an "Ubuntu" boot entry in the EFI boot menu. Today, I'm able to see the "ubuntu" entry in the menu, but, selecting it brings me to a "Boot Failed" screen. I'll get another dump of the disk info first thing in the morning and send it over. Jordan: Thanks, that would be helpful. of the EFI System Partition. Thanks. Attaching the logs and 1M dumps for sdb and sdb1. Thanks - I'll investigate that. I should have asked earlier, but could I also get a screenshot of the "Boot Failed" screen? I'd like to get a sense of which layer in the stack is emitting it. For 13.10, I confirmed that the new grub2 packages allow us to fully boot into the operating system (yay!!). This is true for both LVM and non-LVM auto-partitioning options. Thanks for all of your help, Colin. I'll also test what fixes are present for 12.04. I tried today's build of 12.04, which seemed to have the two fixes committed yesterday. The installer completed OK, but, it appears that the EFI boot entry somehow didn't get set..In other words, the server couldn't find anything to boot from and, upon further inspection, there was no 'ubuntu' entry available in the EFI boot menu. I ran out of time today to dive into this, but, I'll try again on Monday and gather up logs if the problem persists. Accepted grub2 into precise-proposed. The package will build now and be available at http://launchpad.net/ubuntu/+source/grub2/1.99-21ubuntu3.11 in a few hours, and then in the -proposed repository. * Rebuild against grub-efi-amd64 2.00-19ubuntu1. Tested today's 12.04 builds that contain what appears to be the bulk of the grub2 version 1.99-21ubuntu3.11 packages. Install completes without crashing, but, I still end up with no 'ubuntu' entry in the EFI boot menu. I can navigate to the grubx64.efi file on the hard disk via EFI boot menu, though and attempt to boot from file that way. I'm then dropped to a grub command prompt and from there I can boot the OS. This particular partitioning scheme (Use entire disk without LVM) left me with a 5GB EFI system partition and a 137GB Swap partition once the OS booted up. Looks like there are some other fixes being queued up so I'll hold off further testing until I see those go out. I tried today's build (Oct 4th) and realized that partman-base hasn't had its fixes ported to precise yet (whoops), which means the 1TB disk is still only showing up as 125GB. The efibootmgr stuff also needs to be ported (I think). I'll wait until those fixes get pushed into 12.04 before continuing further testing. is too small on a disk with 4KiB logical sectors (LP: #1065281). Accepted partman-auto into precise-proposed. The package will build now and be available at http://launchpad.net/ubuntu/+source/partman-auto/101ubuntu2.2 in a few hours, and then in the -proposed repository. Wait, what? Why does it need to be 512 MB now? I already thought that 100 MB was absurdly large. Accepted partman-base into precise-proposed. The package will build now and be available at http://launchpad.net/ubuntu/+source/partman-base/153ubuntu6 in a few hours, and then in the -proposed repository. Note that this is still missing the last currently-known piece, namely efibootmgr. I'll review James' branch for that by tomorrow at the latest. Accepted efibootmgr into precise-proposed. The package will build now and be available at http://launchpad.net/ubuntu/+source/efibootmgr/0.5.4-2ubuntu1.1 in a few hours, and then in the -proposed repository. Tomorrow's precise daily build should finally be worth testing for this. Collin, rather than waste more disk space why not fix the real bug in mkdosfs ( in that it fails to switch to fat16 at < 133 MB )? Please note that my first name contains only one "l", not two. want to get into this could you please take it to a separate bug? Oh, so the size increase only applies for 4k drives? I suppose that's ok then, I was just worried that half a gig was significant on a 16 gb ssd. Tried with today's Precise Server Build. Doing a full boot loader test is awkward due to the involvement of a signed image, but I've confirmed the bug with grub-fstest and grub-mount, and built versions of those tools with that patch which can successfully read all the files under /EFI/ubuntu/. I'll prepare a backport. Accepted grub2-signed into precise-proposed. The package will build now and be available at http://launchpad.net/ubuntu/+source/grub2-signed/1.9~ubuntu12.04.6 in a few hours, and then in the -proposed repository. With today's Precise Server image I can now boot the Operating System! The system will boot up after about 10 seconds. The verification of the Stable Release Update for partman-efi has completed successfully and the package has now been released to -updates. Subsequently, the Ubuntu Stable Release Updates Team is being unsubscribed and will not receive messages about this bug report. In the event that you encounter a regression using the package from -updates please report a new bug using ubuntu-bug and tag the bug report regression-update so we can easily find any regresssions. * Build against grub-efi-amd64 1.99-21ubuntu3.14 (LP: #1065281). ubiquity got the necessary included source packages in trusty some time ago.